Follow our easy, step-by-step, photo illustrated recipe to make this warm and filling Potato Soup. Made from scratch, using fresh potatoes, it’s a perfect soup for a cold winter night. Make it as creamy as you’d like. Printable recipe included. When the temperature drops down to 12°F here in the South, that’s cold enough for me. Too cold to be more exact. I just don’t get along well with cold weather. At least we weren’t expecting any snow, so that was one good thing in our favor. It’s nights like this that make me wish I still had a fireplace, or maybe even an old wood stove. I’ve lived in a few places that had fireplaces, and I like watching the fire when it gets really cold. It’s also something you can actually back-up-to and get warm when you feel chilled to the bone. Sadly, I don’t have one where I live now. So, you start looking for ways to warm up. I’m also coming off, or at least I think I am, a battle with the flu that has gone on for a couple of weeks. It’s the first really nasty bug I’ve had in a couple of years, and I’m thankful that at least now I’m on the recovering side of it. With my first venture back to the North Carolina State Farmers Market over in Raleigh this past week, I picked up some local potatoes to make a batch of Potato Soup. I also picked up a few Sweet Potatoes that I’ll be baking very soon. Mama didn’t make Potato Soup for us when I was growing up. I think the first time I tried it was when my wife brought home a big container of it from a local restaurant. She also had a big circular loaf of bread to make a bread bowl with, and quickly served it up to me while I was still at work. She had gone with a friend to a restaurant and loved the soup so much that she ordered a take-out for me to try. It was delicious and I’ve loved it ever since. You’ll find numerous ways to make it in cookbooks and on the Internet. 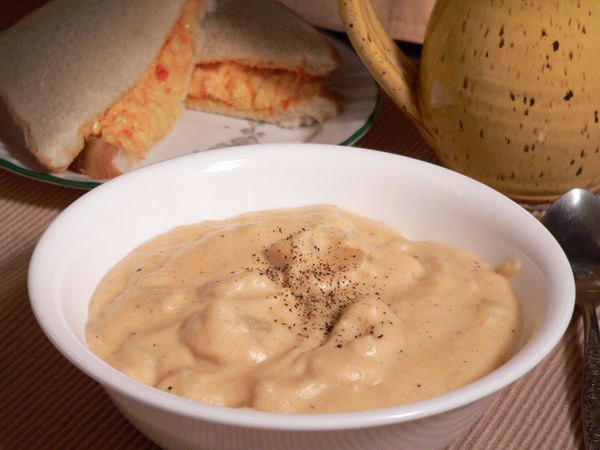 Some folks make a fully loaded version with various types of goodies added in, but I prefer the basic Potato Soup recipe that you’ll find here. It’s super easy to make. 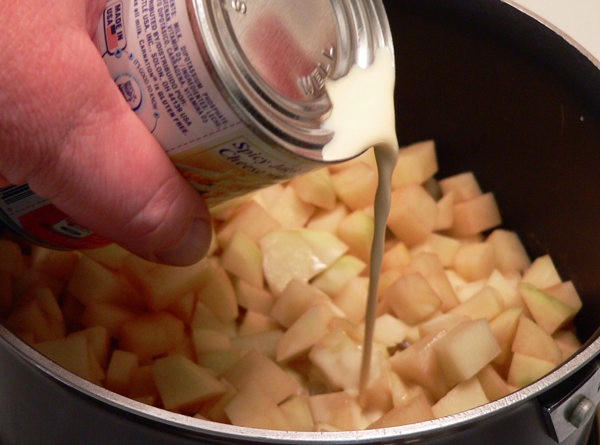 You just dice up a few potatoes and onions, toss it in a sauce pot with some butter and milk… and stir. You just need to keep the stirring part active, as you don’t want it to scorch or burn on you. Other than that, it’s really pretty simple and straight forward. I hope you’ll try it. Throw another log or two on the fire if you have a fireplace, and let’s whip up a good, hearty soup, that is filling and satisfying to the soul. It’s guaranteed to warm you up, so if you’re ready, let’s get in the kitchen, and… Let’s Get Cooking. 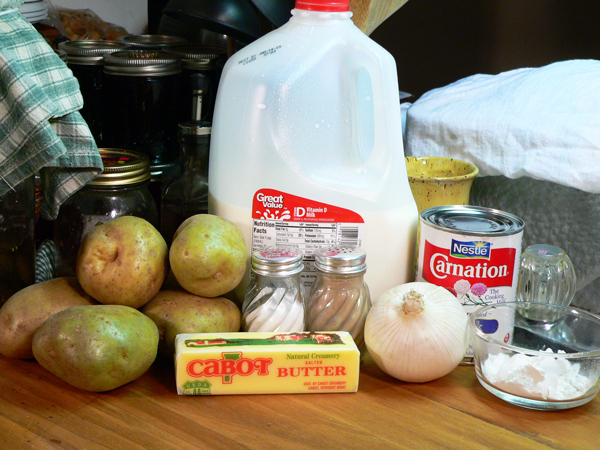 Potato Soup: You’ll need these ingredients. You’ll need to wash and scrub the potatoes well, then peel them. Cube the potatoes into about one half inch cubes. Set them aside for now. Remove the outer skin from your onion, then dice it into small pieces. 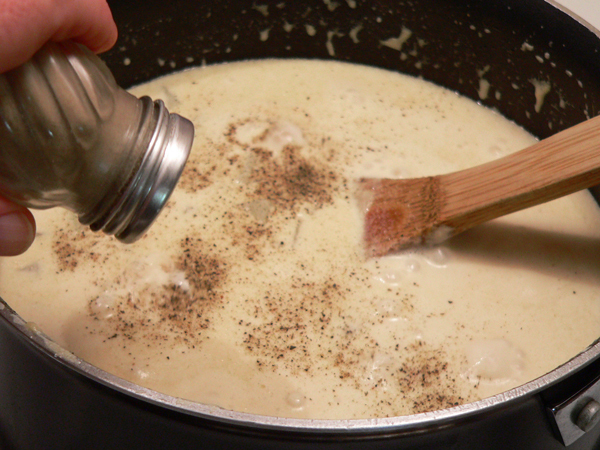 Place a medium sauce pot over Medium heat on your stove top. Add the butter and let it begin to melt. 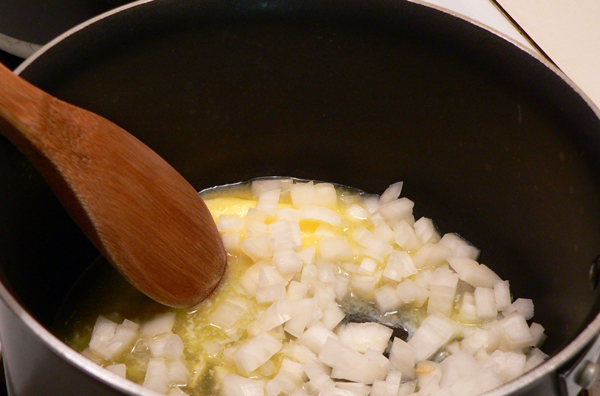 Add the diced onions to the sauce pot and stir them into the butter. Let the onions cook, stirring often, until they are tender and translucent. Add the potatoes to the onions and butter. As you can see, my potatoes had started to turn brown. As it often happens, about the time I got the potatoes cut up, the phone rang. I spent about 30 minutes on the phone with one of my fishing buddies and the potatoes were just sitting out on the cutting board. If you think it will be awhile before you get to cook your potatoes after you’ve cubed them, place them in a bowl and cover them with water until needed. Drain the water off and then add them to the pot. This will keep them looking fresh much longer. It doesn’t hurt the taste, just keeps them from turning dark. Add the Evaporated Milk next. Please note that this is NOT the sweetened condensed milk, but regular evaporated milk in the can. Stir everything together well. 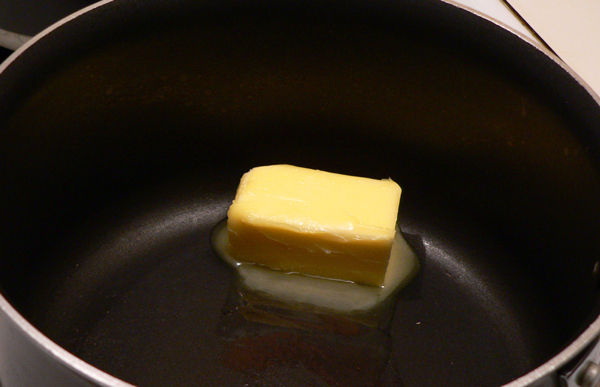 The butter will float on top for awhile, but that’s okay. Bring this mixture up just to the boiling point. You’ll need to keep stirring it while it heats up to make sure the milk doesn’t scorch or burn in the bottom of the pot. Watch for it to get to the point where it just starts to bubble a bit, then REDUCE the heat to around Medium-Low. 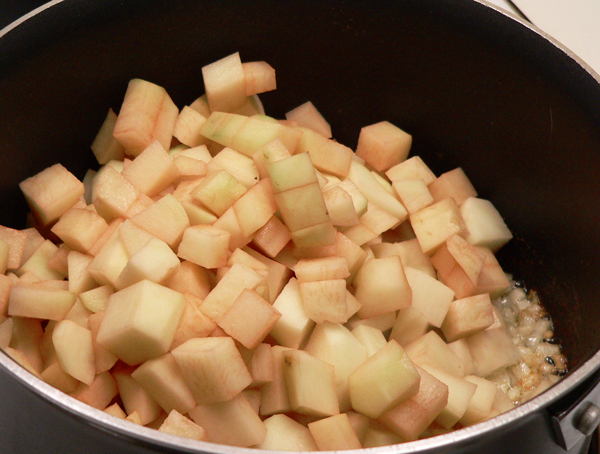 Let the soup continue to simmer, stirring often, for about 20-25 minutes or until the potatoes are tender. Do not let the mixture burn. Be sure to scrape the bottom of the pot as you stir as well. Once the soup begins to thicken, taste it to see if it needs salt. Add salt as desired. Add a little Black Pepper if desired, all to your personal taste preferences. You’ll need to taste a piece or two of the potatoes to be sure they are getting tender. 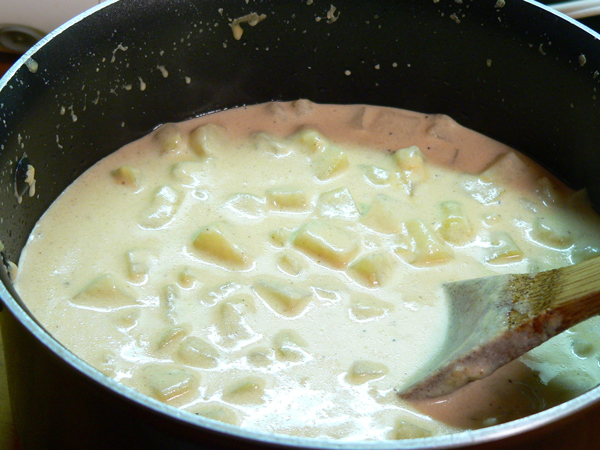 The mixture should begin to thicken after about 20-25 minutes. 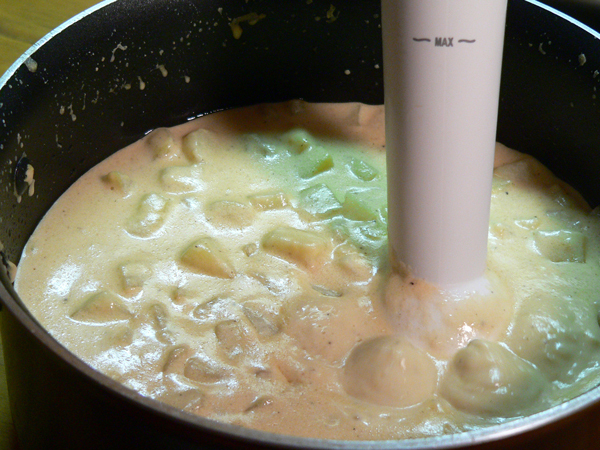 I used my immersion blender to mash up some of the potatoes. You could do this with the back of a large spoon, or a potato masher if you don’t have the hand blender. Either way, mashing up some of the potatoes will vastly improve the flavor of the soup. Use caution if you use a hand blender. 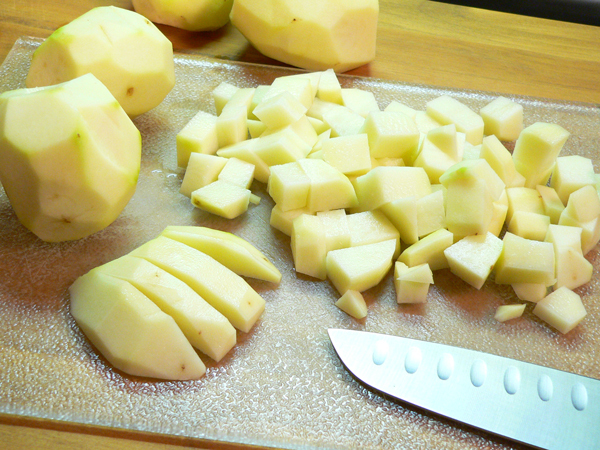 It only takes a second or two to cut up some of the potatoes. Any longer and you’ll end up making mashed potatoes. I like mine thick and creamy, but you don’t have to go that far. Also, if the soup doesn’t appear thick enough for you, you can mix equal parts of flour and cold water together, about 2 Tablespoons of each, then stir this into the soup as a thickener. Just mix the flour and water to make a slurry, then pour it into the soup, stirring it in well. Let it simmer another couple of minutes to cook the flour a bit and thicken the soup. You can garnish the soup with some grated cheese, or perhaps some crumbled ham or bacon if desired. Follow our easy, step-by-step, photo illustrated recipe to make this warm and filling Potato Soup. Made from scratch, using fresh potatoes, it’s the perfect soup for a cold winter night. Make it as creamy as you’d like. Peel and cube potatoes into about one inch sized pieces. Set aside. 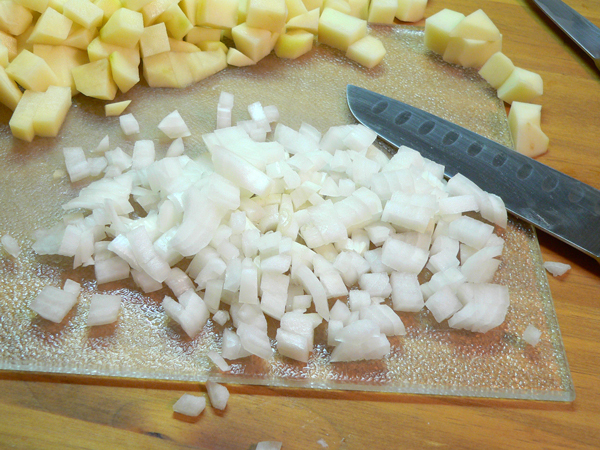 Remove outer skin from onion, dice into small sections. Place medium sized sauce pot over Medium heat on stove top. Add onions. Saute onions until tender and translucent. 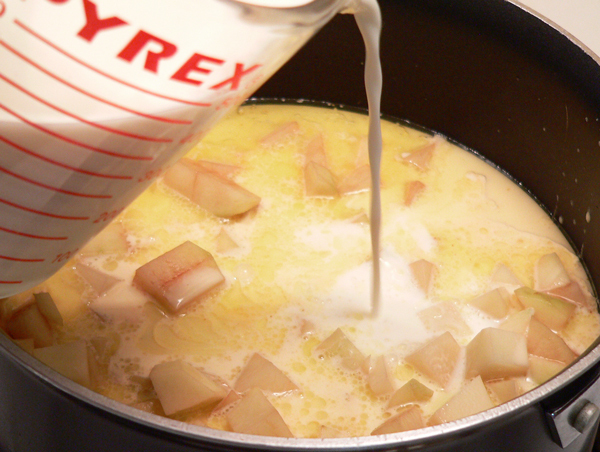 Add two cups whole milk, or more if needed, to cover potatoes. Bring mixture to a slight boil, then REDUCE heat to medium-low. Simmer mixture, uncovered, until potatoes are tender, stirring often. About 25 minutes. Add salt and pepper to taste, as desired. 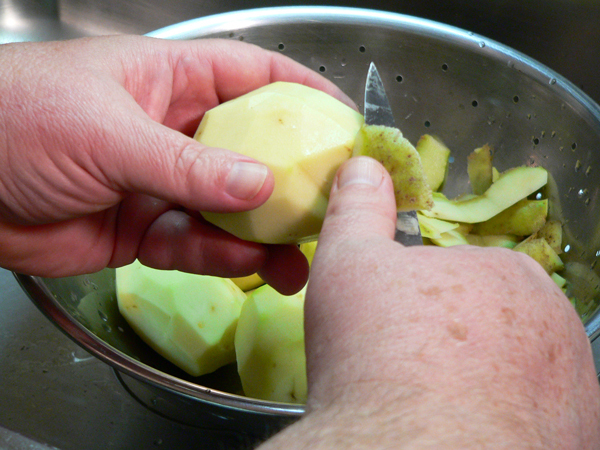 Use a hand blender or large spoon to mash up some of the potatoes. Do not over blend. 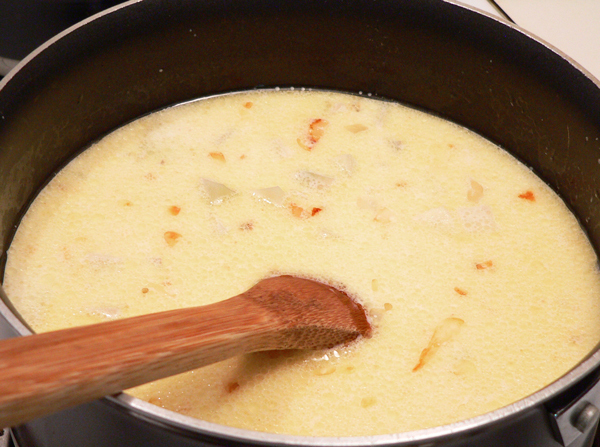 To thicken the soup if needed, mix water and flour together in a small cup. Stir well to combine and make a slurry. Gradually add flour slurry to the potatoes, stirring well. Continue to cook for about five minutes until the mixture thickens. 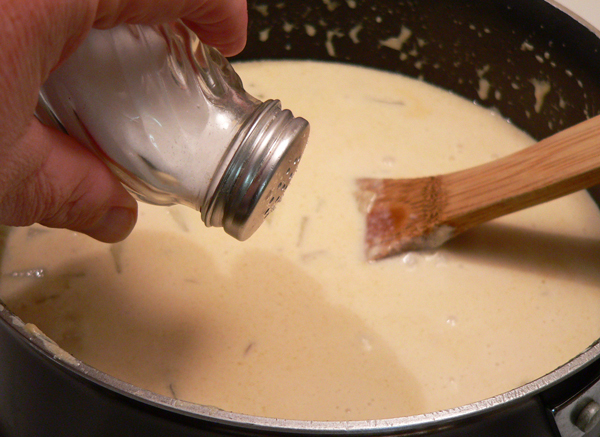 Garnish the soup with grated cheese, or with crumbled ham or bacon if desired. Your Comments: Have you ever tried Potato Soup? Do you like it thick or thin? I’d love to hear your comments on our recipe. It will only take a couple of minutes to share your thoughts while you’re here. And, if you try our recipe, be sure to share your results. It might just encourage some of our other readers to try it as well. Just know that all Comments are moderated. That just means that I personally read each and every one of them before they are approved for our family friendly home here on the Internet. It may take a little time for your comment to appear, but I’ll get it posted just as soon as possible. Thank you in advance. Sign Up For Our FREE Newsletter: Each week, I send out a E-mail Newsletter to let you know about the newest recipes here on Taste of Southern. It’s a great way to remember to check back, and a great way to keep up with our Contest and Giveaways, or anything else of interest that might be going on around Taste of Southern. It’s absolutely FREE to Sign Up and get started. And, should you ever decide you’re just no longer interested, it’s super easy to Un-subscribe. To Sign Up, just add your information to the box below, or into the box you’ll find in the top right hand corner of each page of our website. I’ll be looking forward to seeing you on our list. Thank you also for sharing our information with your family and friends. It helps us, it will hopefully help them. I sincerely appreciate all your support. I had been experimenting with different recipes and finally went rogue. I added some ground sausage while browning some onions and it was really good. My broth was lighter as I used chicken broth instead of cream. Looking forward to the next pot! Thanks for the helpful recipes and info! Great recipe! I’ve experimented a lot this past year with potato soup. Some not bad but complicated. This one is quick and simple and very tasty. Everything in less than an hour. A little cheese and bacon and it’s lunch. Thanks Steve! 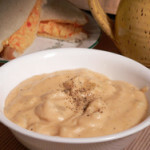 This is very like my mom’s but she boiled onions and potatoes till tender then added cream of celery soup and whole milk. When I started making it at about 12 yrs.old I added leftover mashed potatoes and got rave reviews! I’m now 61 and now saute celery and garlic with the onion and potatoes and use only evaporated milk. I cut some potatoes super small so they break down while cooking making soup thick. Love. Your website. Oh by the way there is 3 ft. of snow on ground here in Scottsbluff, Nebraska! Thank you so much! That looks wonderful. It’s very chilly and damp where we live and tater soup would be perfect today. I love your site. Thank you for keeping it real. I haven’t seen a single recipe calling for stuff like arugula,goat cheese, or basalmic vinegar. Thank goodness! Dear Steve. Thanks for this recipe. I have always been a little afraid to make homemade soups; but this one appears to be foolproof and l am encouraged to try it. I love your Mom’s recipe for biscuits. They do remind me of Home. Happy New Year!